This photograph dates back more than forty years. It's from Old Sturbridge Village in western Massachusetts on one of our frequent visits to the charming recreation of a New England farm town in the 1820s. It’s a place our family loved when the children were young and when we were first in the thrall of the four seasons, the patina and the history of early America. Still are. Old Sturbridge depicts life in rural Massachusetts of that early time. Interpreters play the roles of blacksmiths, basket makers, coopers and the like. It was a magical place to celebrate Thanksgiving in the old tavern, something we did several times when we lived in Wellesley. The elder shown here deftly wields his knife to forge a whistle out of a pea pod. 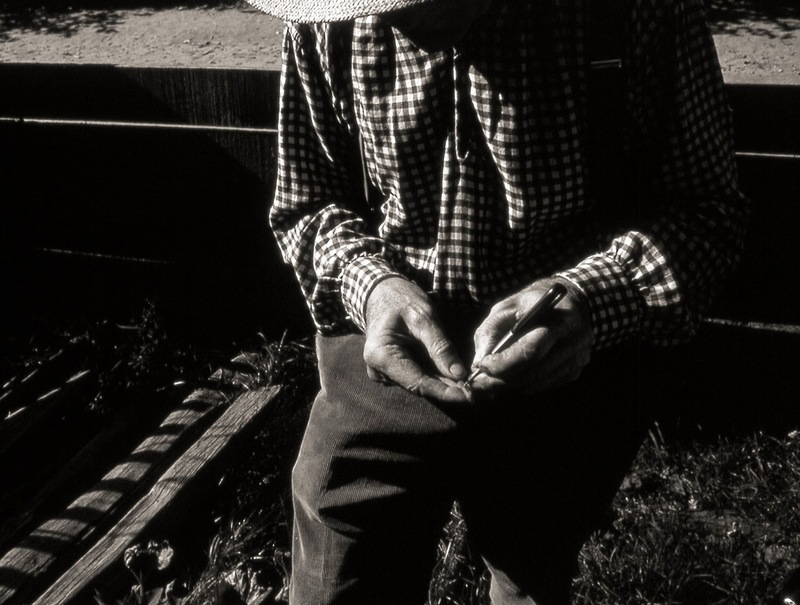 His weathered hands pay homage to rigorous life on the frontier. The brim of his straw hat shields hands from the high November sun. It's a scan of a negative from my first DSLR, the seminal Pentax Spotmatic, and though I've lost some shadow detail, the image carries me back to the richness of New England and deep feelings that will never fade. A lovely image, Steve. The photograph reminds me of a wonderful series on PBS titled The Craftsman's Legacy. It features not just males but females of the species doing what they do best. This week's episode featured a woman blacksmith and she was very, very good at her craft. I hope we get more of this type of photograph from you, Steve. Awaiting as well more about Cuba y borregos. Fine one, Steve. Looks like the seed for a series, a book, even. As does the Cuba Story. Thanks Daryl and John. We lived longer in New England by far than anywhere else, nearly thirty years. So it has a real deep hold on me.